Once in every generation a person rises up above the crowd to reveal the truth of our age. This individual shows us who we really are and the way out of the chaos and confusion that surrounds us. At this moment, in this time, that person is David Icke. In this incredible 4 hour presentation, author and truth-teller David Icke reveals how the human race got into the present global crisis and the keys to getting out. This no-holds-barred examination of the machinations underlying global events and the mechanisms of control used to keep us in fear and confusion, opens our eyes to the truth what is really happening behind the scenes of our reality. This awareness is a necessary step towards our ultimate liberation as a race, as a species, and as residents of Planet Earth. In the second half of his riveting presentation, Icke presents a blueprint for ways to release ourselves from the current crisis, not by living on our knees but standing firm, free and fully awakened. Icke unveils the crossroads that we currently face and how the final choice boils down to either freedom or fascism. Join David Icke for this 4 hour revelation as he leads us on a path towards the ultimate emancipation of the human race through the revolutionary power of love. 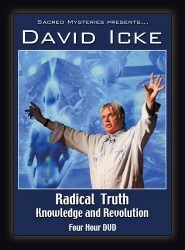 Radical Truth is David Icke's most spiritually uplifting film.